Texas Republican Rep. David Simpson wants to end marijuana prohibition. So, on Monday, he introduced a bill that would do just that: strike all language on marijuana from Texas law. Simpson says his opposition to prohibition is rooted in his faith — “I don’t believe that when God made marijuana he made a mistake that government needs to fix,” he said in a recent op-ed — and he’s not alone among conservatives. There is a small but increasingly vocal share of Republicans who see the issue as one of government overreach. And their ranks — and influence — are growing. Just last week, potential presidential prospects Sen. Ted Cruz (R-Tex.) 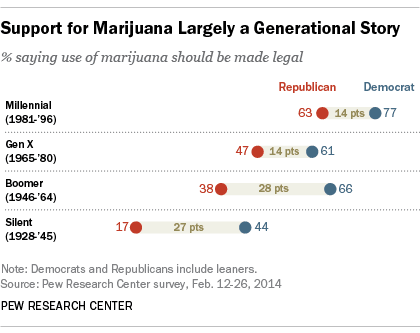 and former Florida governor Jeb Bush were asked where they stood on marijuana legalization. Both said they oppose it personally, but support state’s rights when it comes to legalization. But some rank-and-file Republicans would take it even further. “It disturbs me greatly that Republicans would distort the principles of small government, fiscal responsibility and personal liberty in such a way that they could support the failed principle of marijuana prohibition any longer,” Ann Lee, co-founder and executive director of Republicans Against Marijuana Prohibition, said in a statement promoting Simpson’s bill. Lee, 85, is a lifelong Houston Republican who came to support ending prohibition through her son, who discovered the medicinal uses of the plant after a workplace accident in 1990. She founded RAMP in 2012 and the group has been in touch with Simpson’s office. “This is really achievable within Texas and we feel like other red states really need the GOP to be vocal on this issue,” says Zoe Russell, RAMP’s assistant executive director. RAMP also has a chapter in North Carolina and is working on expanding to Maine, Tennessee and Arizona, Russell says. Once the state sessions are over, the group plans to shift focus to presidential politics. “Whoever gives us the best options within the GOP on marijuana policy, we want to push them as far as we can in the GOP field,” Russell says.